This summer has seen more of the original cutters in comission than at any time in the 18 years since the start of our association. Letty, Breeze, and Frolic are undergoing restoration. 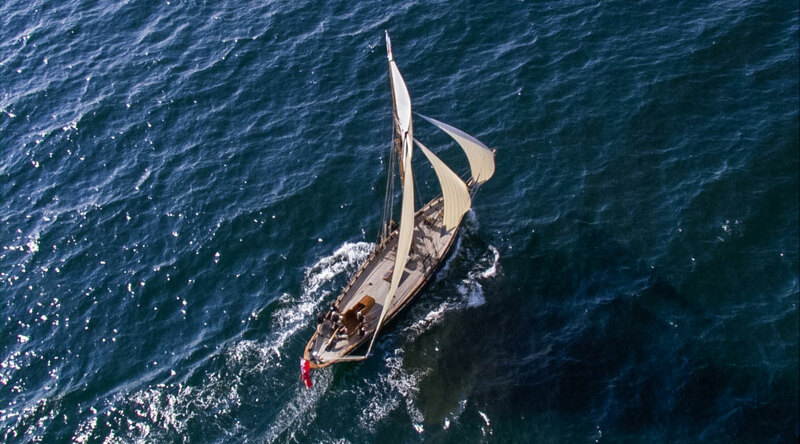 The two Hambley built cutters, Baroque (Tilman’s last boat) lying in Sweden and Marian in Falmouth are both for sale. Madcap is in new ownership in France, privately owned but based in La Rochelle Maritime Museum. Three association cutters entered the St Mawes review , the new staggered start worked well. The following weekend, Sunday 1st June, was the start of our second Falmouth to Fastnet race. Taking part were Mascotte, Marguerite, Cornubia, Marian, Olga and two non originals Iris and Jan Rorlan. Diccon Pridie crewed on Olga and here is his account of the race. The 9am start at Pendennis point was a light wind affair, windward to the Manacles with Olga in the lead. As the wind filled in Marian, Mascotte and Iris came past but the powerful Jan Rorlan after getting ahead spent some time with someone, probably skipper Wes at the mast head reeving a rope and dropping back again. By Sunday evening we were all still hard on an increasing wind trying to weather Longships light. Jan Rorlan had gone inside the rock while Mascotte and Olga were outside and the others not far behind and that was the last we saw of any of them for about 48 hours. The total race was hard on the wind all the time and that night and Tuesday night it seemed to blow NW then WNW 5/6 quite a bit. Sunday night we romped along to windward heading west, little did we know that Mascotte had had to retire with topmast failure. Monday the wind went away and our ever resourceful crew caught and cooked mackeral . As the wind came in we tacked north towards the Irish coast which we closed with on Monday night in the region of Youghal. All Tuesday hard on the wind tacking down the coast, by the evening we were near Baltimore . Here we were boarded by the Irish Boarder Force for identity checks, did we look suspect? We asked them to try and do the same for the rest of the fleet! The final 6 hours against foul tide and rising wind to round the light got even more gruelling, especially as our skipper Mat was sure he had seen Iris and Marian heading into Baltimore in the fading light. Little did we know that they had retired long ago and motored in. How could we be so far behind we felt. Our tactition, Tommi Nielsen kept us focused on the goal of rounding the light after what was for me the longest windward sail of my experience. The reward was to find that we were less than 2 hours behind Jan Rorlan so had won on corrected time. This win is a credit to Swansea Museum to have restored Olga to this condition ,the culmination of many years dedication by Garethe and her team. The Fastnet race was also the third in the association race series so Olga also won the Nielsen Challenge Cup with 5 points ,Mascotte second 4 points and Peggy third with 3 points. Another notable cruise and exploration this summer was Dolphin’s second to Greenland via Iceland and back to Swansea. Roger Capps will give us a talk on his wealth of experiences there at our spring meeting to be held in April in the Falmouth area. The Autumn meeting in Pill was well attended and the Punt & Pilot race was blessed with sunshine on the muddy banks of the Avon. Simon Winter (sponsor of Fastnet Race) won for Cornubia. After lunch at the Memorial Club Pilot Rob Wall gave us a very amusing and enjoyable talk on the history of Pill and the Pilots.